Barakaldo is a city in the Basque Country in Spain. 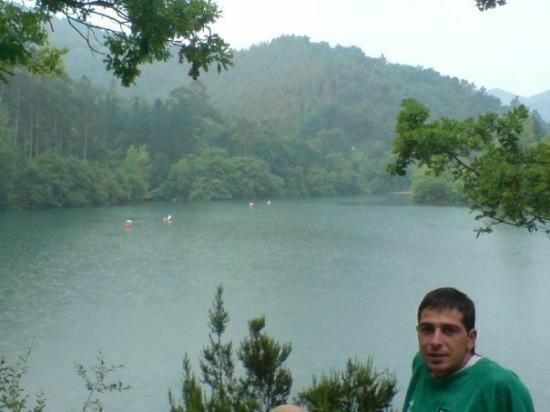 It is located in the Biscay (Bizkaia) province, administratively included in the "Basque Autonomous Community", on the left bank of the Estuary of Bilbao. Barakaldo is part of Bilbao's metropolitan area (Greater Bilbao), and its official population at the 2011 census was 100,061 inhabitants living on a land area of 29.39 km2 (11.35 sq mi). The area has an industrial river-port heritage and has undergone significant redevelopment with new commercial and residential areas replacing the once active industrial zones. "Pop. (1900): 15,013. Few Spanish towns have developed more rapidly than Baracaldo, which nearly doubled its population between 1880 and 1900. During this period many immigrant labourers settled here; for the iron works and dynamite factory of Baracaldo prospered greatly, owing to the increased output of the Biscayan mines, the extension of railways in the neighbourhood, and the growth of shipping at Bilbao. The low flat country round Baracaldo is covered with maize, pod fruit and vines". Modern Barakaldo was later the endpoint of a mining railway, since iron mining was a major economic activity of the region during part of the 19th and 20th centuries. The Steel industry, led by Altos Hornos de Vizcaya, had a very important presence during the 20th century, until the industrial recession hit the region's economy hard in the 1980s. Over recent decades, the industrial zones surrounding Barakaldo have declined in importance as several large companies have shut down, (e.g. Babcock & Wilcox). There are still some active factories, however areas, that were once largely industrial, are continuing to be redeveloped into residential properties, parks and shopping malls (e.g. IKEA and the MegaPark). A large exhibition centre (BEC, Bilbao Exhibition Centre) has recently been built on the outskirts of the town at Ansio. With all the industries, the population of Barakaldo went up and in 90s it had more than 100,300 people. When all the industries closed the population of Barakaldo decreased and in 2002 the population was 95,000. In 2013, Barakaldo had 100,502 people. Barakaldo is linked to the rest of the metropolitan area by line 2 of the underground which has four stations in the town (Gurutzeta/Cruces, Ansio, Barakaldo and Bagatza) and by the Cercanías Bilbao train line, with two stations in town (Lutxana and Desertu-Barakaldo). BizkaiBus company provides a bus service, with connections to the rest of Biscay. The main road that goes around Barakaldo is the Bilbao to Santander A-8 motorway, that links Barakaldo with the metropolitan area and the rest of Spain. A regular boat ferry services connect Barakaldo to the other side of the Estuary of Bilbao (Erandio). 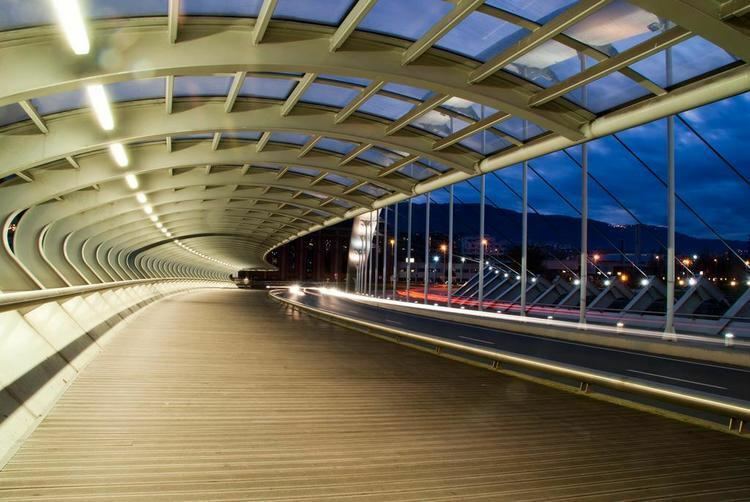 Barakaldo is located 15 kilometres (9.3 mi) from Bilbao Airport, getting there takes around 15–20 minutes by car. The city also has an urban bus system called Kbus. It has one line and a second one to be opened in late 2014. There is a tram line in the study process to connect all the districts that are not communicated with the rest of the city by other transports. Tourist can visit sites in Barakaldo like the Botanic Garden, the Bilbao Exhibition Centre, the medieval Bridge of Castrexana, street sculptures, etc. There's a tourism office in Resurrección María de Azkue Avenue. Every July the town celebrates "Las Fiestas del Carmen", with open-air concerts, fun fairs and a good deal of late night partying. The city has a football club in Spain's Segunda B - Group 2, Barakaldo Club de Fútbol that play their home games at the 8,000 capacity Estadio Nuevo Lasesarre, and one in Tercera División, Retuero Sport. Apart from these teams. ; Sporting de Lutxana and US San Vicente have militated in national competitions. Others teams like Gurutzeta KFT, UD Burtzeña, Pauldarrak FKT, Zuazo C.F. and S.C.D. Dosa-Salesianos also represent Barakaldo in local leagues. In Handball Barakaldo have a great tradittion. Now twoo teams are present on competitions. Club Balonmano Zuazo Femenino that is playing on División de Honor de balonmano femenino DHF. And Balonmano Barakaldo that was playing some years ago in ASOBAL league, and now is in primera division. Bizkaia Arena is an indoor arena in Barakaldo with a capacity of 18,640. It has hosted games of the 2014 FIBA Basketball World Cup.